^ Charatcharoenwitthaya P, Lindor KD. Primary sclerosing cholangitis: diagnosis and management. Current Gastroenterology Reports. Feb 2006, 8 (1): 75–82. PMID 16510038. doi:10.1007/s11894-006-0067-8. ^ Sleisenger, MH. Sleisenger and Fordtran's gastrointestinal and liver disease: pathophysiology, diagnosis, management 8th. Philadelphia: Saunders. 2006. ^ Tabibian JH, Lindor KD. Ursodeoxycholic acid in primary sclerosing cholangitis: If withdrawal is bad, then administration is good (right?). Hepatology. Sep 2014, 60 (3): 785–8. doi:10.1002/hep.27180. ^ Tabibian JH, Yang JD, Baron TH, Kane SV, Enders FB, Gostout CJ. Weekend Admission for Acute Cholangitis Does Not Adversely Impact Clinical or Endoscopic Outcomes. Dig Dis Sci. 2016, 61 (1): 53–61. PMID 26391268. doi:10.1007/s10620-015-3853-z. Epub 2015 Sep 21. ^ Tabibian JH, Abu Dayyeh BK, Gores GJ, Levy MJ. 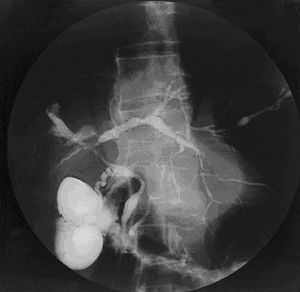 A novel, minimally-invasive technique for management of peristomal varices. Hepatology. 2015, 63: 1398–400. PMID 26044445. doi:10.1002/hep.27925.